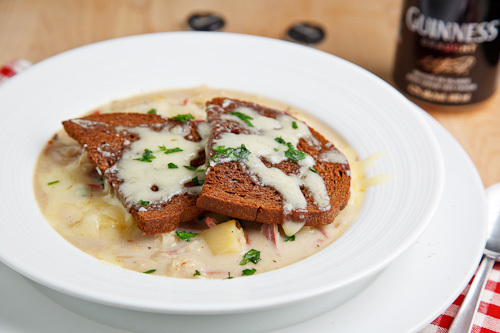 A hearty soup with all of the flavours of a reuben sandwich served French onion soup style topped with dark rye and melted swiss. One of my favorite parts about St Patrick’s Day is the corned beef leftovers and I normally start off by making more than a few reuben sandwiches . Last year I came across a tasty sounding recipe for a reuben soup on Heart Oven to 350 that I wanted to make right away! Unfortunately I had just finished off the rest of my corned beef so I bookmarked the recipe for next year and waited patiently. This year I made sure to start off by making the reuben soup with my leftover corned beef and I certainly am glad that I did! This recipe starts off with the leftover corned beef and then build up the reuben flavours with sauerkraut and some seasonings including more pickling spices and some caraway seeds. The soup is filled out a bit with some potatoes and given a bit of cream for richness. At this point everything was good but I could not help trying to work some of the dark rye and swiss cheese into the soup. 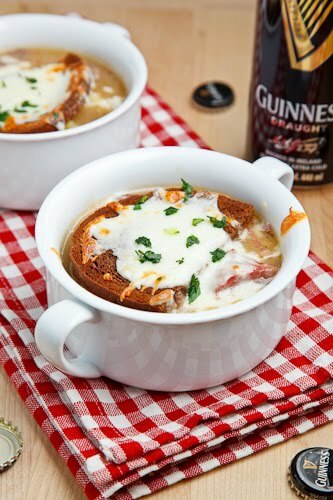 My first thought was to simply serve the soup topped with swiss cheese and a side of toasted rye but then I was thinking that I could make some toasted rye croutons which led me to the idea of serving it French onion soup style, topped with the toasted rye and swiss and then broiled to melt the cheese. No matter how you serve this soup, it is going to disappear quickly! Melt the butter in a large sauce pan over medium heat, add the onion and saute until tender, about 5-7 minutes. Add the garlic and red pepper flakes and saute until fragrant, about 1 minute. Mix in the flour and cook for 2-3 minutes. Add the broth, deglaze the pan, add the corned beef, sauerkraut, potatoes, Worcestershire sauce, pickling spices, caraway seeds and bay leaves, bring to a boil, reduce the heat and simmer until the potatoes are tender, about 10-15 minutes. Add the cream, season with salt and pepper and remove the bay leaves. Divide between 4 oven-safe bowls, top with the rye and swiss and broil until the cheese melts, about 1-3 minutes. Slow Cooker: Implement step 1, optionally implement steps 2 & 3, place everything except the cream, bread and cheese in the slow cooker and cook on low for 6-10 hours or high for 2-4 hours before adding the cream and optionally implementing step 6. This does look like an awesome soup! I guess I'm going to have to make a corned beef so I can have leftovers! Beautiful presentation of a fabulous recipe! A great recipe for leftover corned beef. And, a great alternative to the typical reuben. Seriously? Seriously??? Why didn't we think of this. Holy moly. This. Is. Amazing. Our corned beef is cooking away right now. Now we know what to do with the leftovers. This recipe just made my day! Yum!! We were looking at our pot with the leftover "corned beef stock" tonight following St Paddy's Day dinner & just had the thought of using it for a soup. I'm gonna chill & skim it tomorrow & try out your recipe using that.. Sounds deeelish. Yum yum – got corned beef already. Gonna try this today. Thank you so much for sharing. I like reuben, I like soup. This is a great idea! 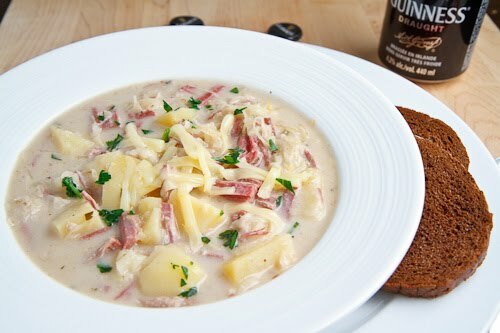 What a great idea to make a Reuben into a soup – defintely a must try. The only thing that could tear me away from those leftover sandwiches is this soup! SO tasty! Wow! the soup looks amazing!! Soup looks delicious, and I'm loving the new layout, Kevin! At first I was about to say ew, but I love Reubens and that's really freaking awesome sounding. This soup was really delicious – thank you for the awesome recipe. DH made me promise to buy 2 corned beefs next year so he can have his leftovers and his soup too. We made the Reuben Soup tonight with the last of the corned beef and it was simply wonderful! Thank you for a great new soup! Your entire blog makes my mouth water just reading it. Looking forward to trying many of your recipes, especially the ones with sauerkraut! Kevin, they all look so good I want to make everything at once. Have to get new ink cartridges for my printer before I can print the recipes off though. First time the weather lets up so I can go out, I'll be printing one after the other.